translations), who tries to cheer him up, but to no avail. storm. Riding on the waves of the storm, Ponyo goes back to visit Ssuke. Lisa, Ssuke, and Ponyo stay the night at Ssuke's house, hoping the storm will be over, whereupon Lisa leaves the house to check up on the residents of the nursing home she works at. 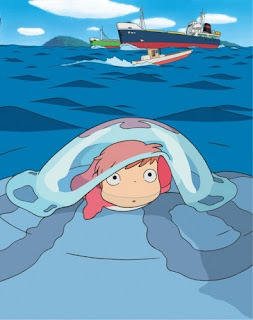 Granmammare, Ponyo's mother, arrives at Fujimoto's submarine. Fujimoto notices the moon has come out of its orbit and the satellites are falling like shooting stars. Granmammare declares that if Ssuke and Ponyo pass a test, Ponyo can live as a human and the world order will be restored. Ssuke and Ponyo wake up to find that most of the land around where the house has been covered by the ocean. Lisa has not come home yet, so with the help of Ponyo's magic, they make Ssuke's toy boat life-size and set out to find Lisa. While travelling they see ancient extinct fish swimming, such as the Gogonasus and Licosus. all forms. Granmammare then allows Ponyo to become human once Ponyo kisses Ssuke on the surface.